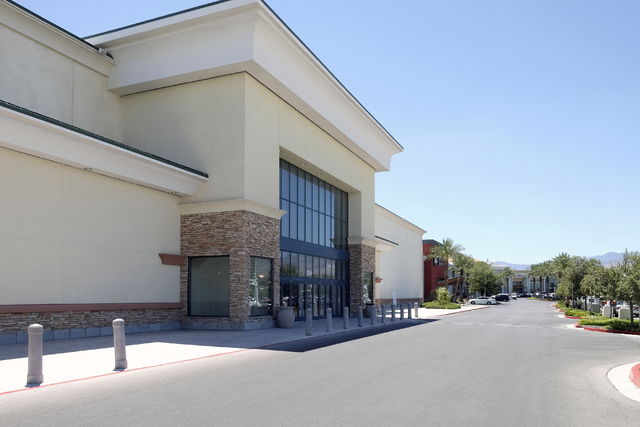 Six years after then-owner Charleston Associates filed for bankruptcy, Trepp LLC, the New York-based analytics firms that monitors the CMBS marketplace, said the 277,000-square-foot Shops at Boca Park is delinquent on its loan with a current balance of $49.2 million. Ulf Buchholz/Las Vegas Business Press. The long-empty former Great Indoors location at Boca Park is shown July 18, 2016. The backside second phase of Boca Park that catered to upscale shopping is in financial trouble again. Six years after then-owner Charleston Associates filed for bankruptcy, Trepp LLC, the New York-based analytics firms that monitors the CMBS marketplace, said the 277,000-square-foot Shops at Boca Park is delinquent on its loan with a current balance of $49.2 million. The securitized loan balance is $58 million. The 100-acre Boca Park at the northeast corner of Rampart and Charleston boulevards was built by Triple Five Development and opened in 1999. In 2003, the second phase opened to cater to upscale shoppers in addition to offering dining options. It was former home to the 140,000-square-foot Great Indoors, which closed. That space was ultimately sold and remains vacant. The onset of the Great Recession prompted people to cut back on retail spending. Charleston Associates filed for bankruptcy in 2010 after the loan originated by Wells Fargo was transferred to a special servicer in 2009 because the borrower could no longer cover cash flow shortfalls, according to Trepp. The lender agreed in October 2012 to transfer the loan and modify it to interest-only payments of 4.75 percent with a maturity date of Jan. 31, 2016. Boca Park developer Triple Five, which did not return calls for comment, holds the loan now and is delinquent, Trepp reported. Triple Five has asked for additional time to refinance the collateral and pay off the loan, according to Trepp. “They will be looking for some sort of workout strategy to keep the loan paid off in some amount even if not available for a full payment,” Trepp’s Sean Barrie, a research analyst with the company, said of the lender. Trepp lists the properties as 710, 740 and 750 S. Rampart Blvd. and those also include Gordon Biersch Brewery Restaurant, Cheesecake Factory, Total Wine &More and Recreational Equipment Inc. The center had a 91 percent occupancy rate before the recession but that fell to 83 percent in 2008, according to Trepp. The center had $4.7 million in annual revenue as of October 2015, down from $5.1 million the previous year. The Trepp report showed a vacancy collection loss of $1 million a year. Boca Park has been a long-standing retail amenity for residents in the Summerlin area and east of Summerlin, said Brian Gordon, principal with consulting firm Applied Analysis. It’s faced additional competition from Downtown Summerlin that opened in October 2014, he said. “There’s no doubt you’ve had an increase in competition with more retail locations opening in Downtown Summerlin,” said John Restrepo, principal of RCG Economics. Downtown Summerlin, a development of the Howard Hughes Corp., has 1.4 million square feet and 92 percent is leased, said Kevin Orrock, president of Summerlin. It will be adding Las Vegas’ first Dave &Busters, a restaurant and video arcade, in 33,000 square feet on Aug. 8. Actress Kate Hudson, co-founder of Fabletics, the active wear brand, is opening a store by the end of July. It’s among 120 spaces leased in Downtown Summerlin, including 30 restaurants and one with 130 brands of tequila. Downtown Summerlin is expected to reach 95 percent occupancy in the next six months to a year, Orrock said. Earlier this year, fashion retailer H&M opened in Downtown Summerlin, abandoning an expected location in Tivoli Village, which is directly north of Boca Park. Orrock said the success of Downtown Summerlin shows the importance of location given it’s situated along the 215 Beltway and between Sahara Avenue and Charleston Boulevard. He called it one of the best-situated retail developments in the country. No tenants from Boca Park have relocated to Downtown Summerlin but some across the Summerlin area have done so, Orrock said.